Clinton Is Running for Obama’s Third Term? Yes, Please. Hillary Clinton, unaware she is associating with the president who has turned American into a dystopian hellhole. 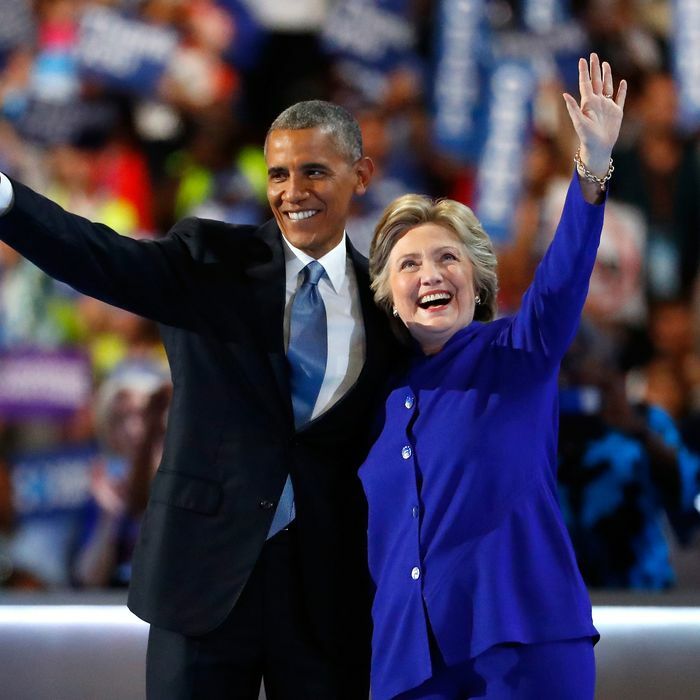 One of the phrases that keeps cropping up in Republican election rhetoric is that Hillary Clinton is “running for Obama’s third term.” Oftentimes it is used as though the distastefulness of such a scenario is self-evident. “POTUS making no bones about it: Hillary running for Obama’s third term,” gloated Republican senator John Cornyn during Obama’s convention speech. Republican strategist Scott Reed argues that GOP members of Congress may have abandoned their nominee 20 years ago, but “Dole was running in ’96 against an incumbent with a 4.5 percent growing economy and world peace. Clinton is now running for Obama’s third term.” This is a bizarre line of reasoning to use against a popular, historically successful president. A third Obama term sounds awfully good, and not just in comparison to the unthinkable alternative. A couple of years ago, the key piece of evidence for Obama’s failure was his approval ratings. In the wake of the failed launch of healthcare.gov, the president’s ratings sagged into the 40s and remained depressed, prompting gleeful Republicans to compare his standing with that of George W. Bush. (The comparison gave Republicans an imagined double victory, impugning the current occupant of the Oval Office while excusing the failures of the previous one.) But the polling depression was short-lived. Obama’s approval ratings have climbed into the 50s, registering 58 percent in the most recent Washington Post poll. But the right-track-wrong-track figure is not historically indicative of a public desire to change party control. It instead reflects longstanding public discontent with a wide range of institutions, public and private, since Vietnam and Watergate. In recent years, it especially reflects the conviction held by Democrats and Republicans alike that their own party is losing. Republicans think the country is on the wrong track because Obama is ruining it. Democrats think it’s on the wrong track because Republicans are preventing Obama from moving forward. Republicans used to cite high levels of unemployment as evidence that Obama’s crushing tax and regulatory policies have stifled growth. As joblessness has receded, they have changed their focus to median income. “We are in the sixth year of recovery, and median income is below what it was at the start of the recovery,” argued Jeb Bush this summer. Bernie Sanders put a left-wing gloss on this same statistical reality, frequently insisting that 99 percent of the new income was going to the top 1 percent. It is true that income has been stagnant for most workers, reflecting the fact that financial crises, like the one that occurred in 2008, produce longer and deeper slumps than normal recessions. The unemployment rate spiked in the wake of the financial crisis, and it has taken years to recover. As labor markets have tightened and labor has grown more scarce, workers have finally gained enough leverage to win higher wages. And while the brightening conditions have been apparent in a slew of data for a long time, official statistics concerning household income operate on long lags. Before today, the most recent official statistics of median income only covered the period through 2014, which predated the tight labor market that now prevails. These numbers only go through last year. 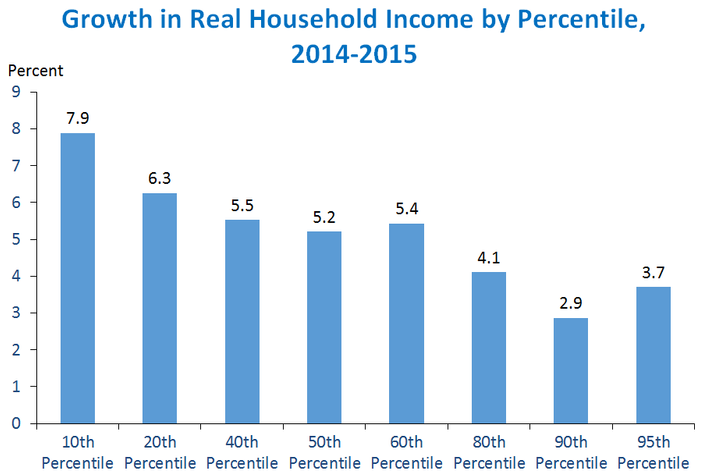 Presumably another year of continued low unemployment will see continued income growth. It is almost impossible to overstate how thoroughly this data nullifies the central charges made against the administration’s policies. The left-wing version of the economic stagnation claim charges that Obama’s program has failed at the root level, allowing the rich to hoover up all the gains and doing almost nothing for the suffering masses. The more popular right-wing version argues that, whatever social benefits Obama has purchased — 20 million more insured, strict new regulations on Wall Street, lower greenhouse gas emissions — they have come at a terrible and unacceptable price. Obama’s big-government agenda has snuffed out the entrepreneurial genius of American capitalism, dooming its people to endless stagnation, unless and until Paul Ryan can liberate them from stifling taxes and regulation. These sweeping philosophical arguments hinged in large measure on a now-moot statistical artifact. Conservatives will obviously never approve of Obama’s policies because they disagree with their ends. Obama has attacked problems like the recession, lack of access to insurance, systemic risk in the financial sector, and climate change with tools like taxes, spending, and regulation, which the right opposed on ideological grounds. They will continue to oppose those policies on first principle, even if the practical side effects of which they warned all fail to transpire. But for the vast majority of Americans who don’t resist Obama’s policies philosophically — and the Republican primaries have revealed just how few committed economic libertarians the Grand Old Party truly has — the practical outcomes are growing harder and harder to gainsay.